On average, Energy Star-certified buildings and plants use 35 percent less energy, cause 35 percent fewer greenhouse gas emissions and are less expensive to operate than their peers — all without sacrifices in performance or comfort. The Energy Star certification process scores buildings on a scale of 1 to 100 for energy efficiency against similar building types across the U.S. A building must have an Energy Star score of greater than 75 to earn certification. The Development Center at 1120 Monroe Ave. NW scored the highest of the six at 97, followed by police support building at 94, 201 Market at 89, police administration building at 88, 509 Wealthy St. SE at 81 and City/County Administration Building at 78. Energy Star-certified buildings and plants are verified to perform in the top 25 percent of buildings nationwide based on weather-normalized source energy use that takes into account occupancy, hours of operation and other key metrics. Energy Star is the only energy efficiency certification in the U.S. that is based on actual, verified energy performance. A professional engineer or registered architect verifies the building’s energy data and certification is required annually. Integrated Architecture completed the audit and certification of the six City buildings. With its six certified buildings, the City has established itself as a national leader in Energy Star certifications. In 2017, only five other U.S. city or county governments had six or more Energy Star-certified buildings – with Denver leading the way with 18. Of the 31 local government buildings certified this year, six are owned by the City of Grand Rapids. A total of 105 municipal buildings in 23 states earned Energy Star certification last year, and only one was in Michigan – a judicial building in Adrian. All six certified buildings are registered with Grand Rapids 2030 District, a public-private partnership managed by the U.S. Green Building Council West Michigan Chapter and committed to creating high-performing buildings that increase marketability and profitability for property owners, improve their environmental impact and strengthen the community’s vibrancy. The City will continue to track energy consumption data at the six buildings, and it is in the process of expanding this effort to all City-owned facilities, said Gary Reimer, the City’s director of facilities and fleet management. 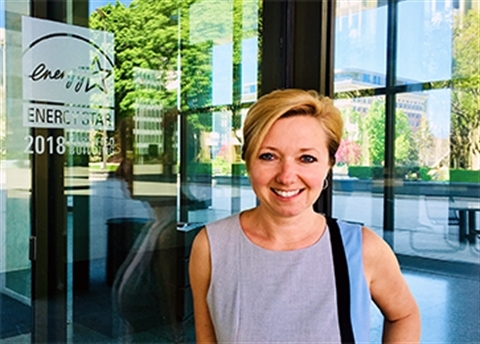 Mayor Bliss kicked off a social media campaign celebrating the City’s certifications by getting a photo taken next to the Energy Star sticker now hanging at the entrance of City Hall. The community is encouraged to do the same – or take a selfie – and use #GRcaresaboutenergy. For more information about Energy Star certification, visit energystar.gov/buildings. For more information about the City’s commitment to sustainability, visit grandrapidsmi.gov/sustainability.